Sometimes all I need in this crazy world is a brisk walk to clear my head and some good music bumping through my headphones. 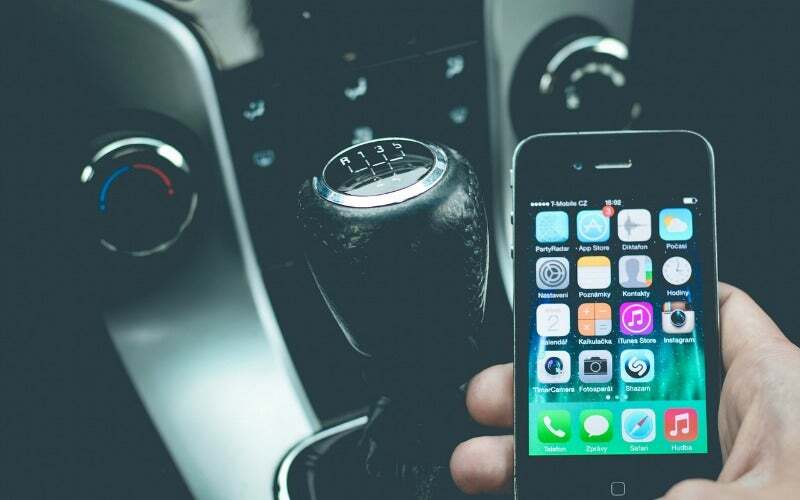 But when that simple pleasure is interrupted every morning by my partner issuing voice commands while I'm out of the house, silencing the music in my headphones, it can be a tad frustrating. It's especially irksome when the root cause is the multiple user preferences of my Google Home, a voice assistant that is there to, ostensibly, make my life a little easier. If you share a voice assistant with another person in your home, you might have run into the same music playback peeve, wondering if you'll ever find peace when your partner decides to play Bruno Mars' 24K Magic for the fifth day in a row. Fortunately, the problem can be easily solved. iOS. You're trying to follow the Google Maps directions to a place you've never been before, and just as things start to get complicated your mum texts. A few seconds later you're put on a group email with everyone at the office and the new message notifications start flying in, as do more texts from your mum who wants to know why you haven't responded to her first text yet. You begin to regret ever teaching your mum how to text. When Google Home debuted, anyone could ask it about about the weather, or traffic on the way to work, but it would only provide answers based on the registered user's information. But plenty of people don't live by themselves — or they have guests who might want to use Google Home for their own purposes. That's why an update in April to the voice assistant enabling multi-user support was so important. It allows Google Home to distinguish your voice from your partner's. It added support for up to six registered users, giving everyone the ability to ask when their next meeting is, or tell Google Home to play more Michael Jackson. The person who wants to add themselves as a user will need to use their own iOS or Android device and install the Google Home app. (Before you open the Home app, be sure you're on the same Wi-Fi network as your assistant.) 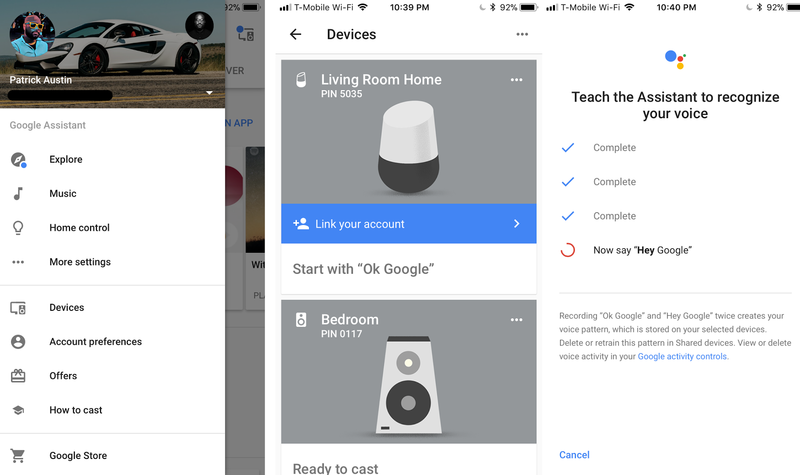 In the Home app, log in with your Google account, and select your Google Home from the device list. Select the blue "Link your account" or "Multi user is now available" banner. You'll be asked to perform a voice calibration test — be prepared to say "Hey, Google" a few times. According to the company, your voice is fed to a neural network, where Google identifies its unique characteristics, making it easier to distinguish between multiple users. Congratulations, your voice assistant can now separate you from your partner! Now, you'll need to pick your music preference. Google Home supports free music streaming from Spotify and Google Play Music services. You can also use the premium versions to request whatever tunes you'd like. Google's YouTube Red and Google Play Music services should work automatically, while Spotify users will have to go through a few extra steps. 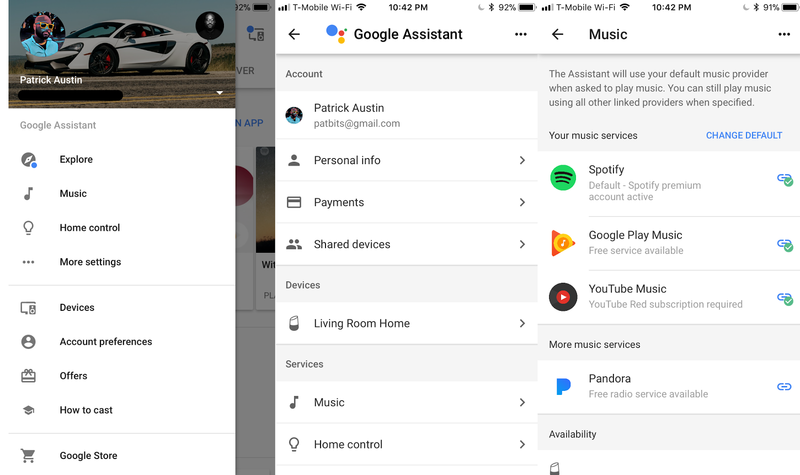 To connect your streaming account (individual or family accounts work just fine), you'll have to drill down into your Google Home profile settings. In the menu, select Account Preferences, then scroll down to "Music" located in the Services section. Select the Link option for your streaming service of choice and sign in with their respective accounts. Got visitors that love to hijack the stereo? 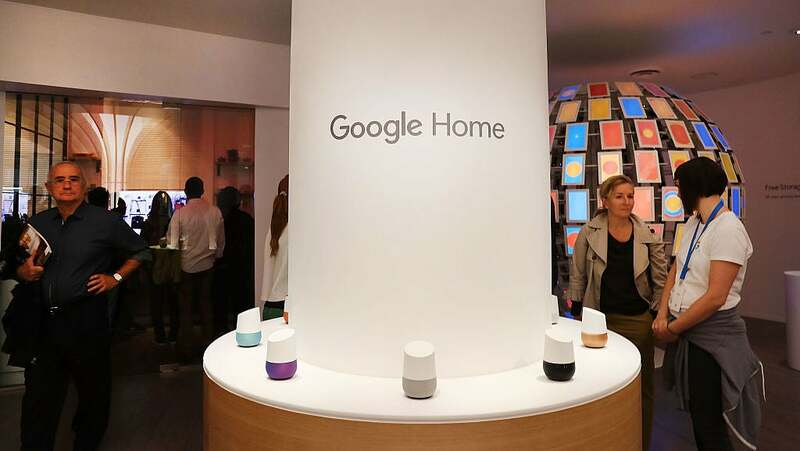 You can prevent them from accessing your personal information while still letting them issue voice commands thanks to Google Home's guest mode. In your list of devices, tap the options button in the top right of your Google Home icon and select Guest Mode, where you can toggle the feature on and off. Guests can still send content using Google's Cast functionality, though they will need to be on a Wi-Fi network. Select "Nearby Device" when attempting to cast content and look for the voice assistant, which will attempt to pair with your phone via audio cues or a four-digit pin. Now, when any user requests a particular song, Google will identify the user and use their account's preferences and services to serve up songs or videos.